It’s always fascinating to understand the study of the origin and evolution of our business universe. There is something uncanny about the parallel bottom up world views that two Ries’s have brought to the fields of marketing and and more recently startups. In the last few years, the startup and UX (user experience) worlds have been buzzing about lean startups , lean design and MVP (minimal viable product) as tangible bottom up ways to evolve and test new products and new companies. Silicon valley entrepreneur Eric Ries has been credited as being the father and pioneer of this “lean startup movement,” a philosophy that originated from the Japanese concept of lean manufacturing. 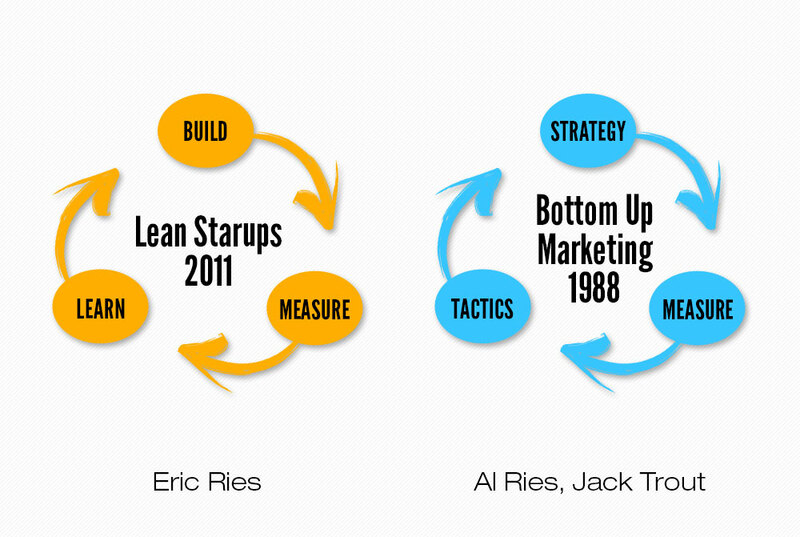 Interestingly however, it was back in 1988, there was another Ries — Al Ries, who along with author Jack Trout pioneered a somewhat parallel concept of lean marketing. They didn’t call it that. Instead they called it bottom-up marketing. But the same essential concept applied: Find and grow successful bottom-up marketing tactics into more operational and then strategic initiatives instead of vice versa. Published in 1989, “Bottom-up Marketing: Building a Tactic into a Powerful Strategy” clearly never imagined a world where a marketing approach could take root as the result of information gleaned from interactions with customers. But such relationships are at the root of the promotional scheme that Ries and Trout preached. The book emphasizes the importance of rank-and-file employees to understanding what customers really want. Because they are closest to the customers, those employees can pinpoint tactics that work, and their bosses can build strategies upon those foundational insights. Ries and Trout cite successes such as the decision by Domino’s Pizza to guarantee deliveries in 30 minutes and FedEx’s messaging shift toward overnight shipping. By contrast, senior managers drive the discussion in the traditional top-down approach to marketing. They define a strategy based on their goals for a company and then identify tactics to implement the strategy. The fact that today’s marketing experts appreciate the wisdom of the bottom-up approach and have applied it to social media demonstrates the staying power of Ries and Trout’s treatise. These two Ries’s two parallel perspectives provide a needed grounding in our modern world. Millenials would consider this the quintessential foundation of “authentic business.” Business that have both tactical authenticity and later strategic authenticity. These two Ries’s did not look down at the world from the constellation Orion. But they looked at it from terra firm. Oh, by the way, the Egyptians have another name for the Orion constellation — which was “Seir.” Can it really be a accident that Seir spelled backgrounds is “Ries”?